Boyfriend birthday wishes can be anything you want them to be, but the best are romantic. 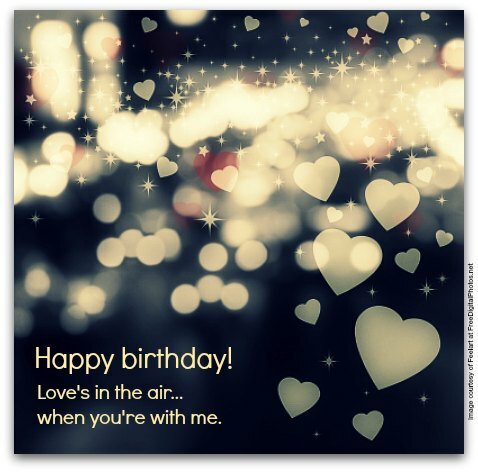 On this page, find only the best, and most original, birthday messages for your boyfriend. What makes birthday greetings for boyfriends the best for yours? The short answer: love and passion. The long answer: any birthday wish that comes closest to how you truly feel about your boyfriend (and exactly why you feel this way about him). There’s nothing I love more than wishing “Happy Birthday” to someone I love more than anyone or anything. Happy birthday! On your birthday, I don't know how you'll be dressed but the only thing I'll be wearing is my birthday suit! Happy birthday, honey! Happy birthday! The minute you walk into the room, time stands still and races ahead all at once. But it doesn't matter, as long as I get to spend my time with you. It's the time of the year that we get to celebrate the love of my life: you, silly. Happy birthday to the best boyfriend. To the universe, you are merely an atom. To me, you're my universe. Happy birthday! Today, let’s stage our very own bed-in and celebrate our love all night long! Happy birthday! We’re not a match made in heaven — I’m no angel and you’re absolutely devilish. But what we got feels just like heaven. When I’m with you, there’s never any rain in the forecast. It’s always sunny and hot. Happy birthday! Walking hand in hand. Standing still. Lying in bed. No matter what we do, I’m so in love with you. Happy birthday, sweetheart! Happy birthday! Loving you silly is my birthday gift to you. Your birthday wish is my command. In your arms, all day or night, is where I want to be. Let’s just hold each other on your birthday! Happy birthday! For us, your special day calls for a special dress code…our birthday suits! My heart beats only for you. My love for you will outlast my beating heart. I love you. Happy birthday! You're a beautiful man. I love everything about you, especially your beauty marks (you know, the ones nobody gets to see). Happy birthday, sweet thing! As far as I’m concerned, you should get an Academy Award for our “Love Story” every day. You’re the star in the movie of my life. Happy birthday, boo bear! Happy Birthday! When I see you, my heart skips a beat, I get butterflies in my stomach, I feel dizzy, my whole life’s topsy turvy. I think I’m lovesick over you. Happy birthday! I love you more than anything or anyone in the world. If I didn't love you so much, I'd really hate you for that.